Chilaxation occurs especially summertime in this Double lot Walkout One Story MAIN LEVEL LIVING w/ In-ground Pool & Sport Court for those enthusiasts (3 Basketballs Hoops). 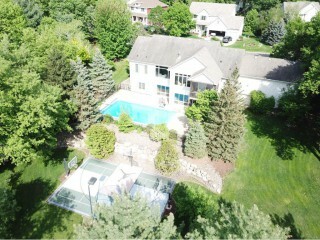 Custom details seen throughout 4 Bed - 4 Bath - 4+ Car Garage (3 car on main, at least a couple in lower spancrete garage). Don't miss 2 Screened Porches, 2 Fireplaces, 2 Laundry sites, Stainless Steel Appliances, Gas Cooktop, Wet Bar - Great room area and tiled bathroom able to walk to from pool. This could be all Yours!